How would you like to know the secrets of the fastest growing subscription companies? Subscriptions are exploding for everything from information, software, to monthly boxes. 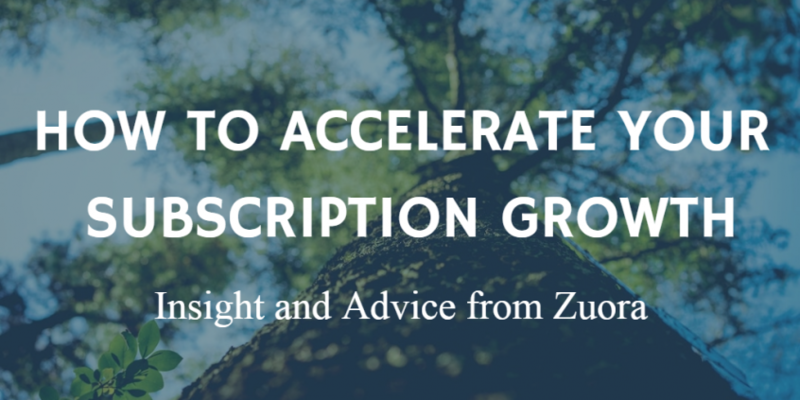 This growth has attracted new resources for analytics, software, and marketing to learn what works and how to grow the largest subscription companies today. These tools can give you more visibility, control and monthly recurring revenue for your subscription program. This interview reveals what the largest players in the subscription economy do to attract new customers, understand their subscribers to reduce churn, and grow their monthly recurring revenue. • Why subscription businesses are growing nine times faster than t	the S&P 500 companies. • Why subscription programs are growing and what you can do to cash	in. • Where 50 percent of the revenue growth comes from within a subscription business. • The various ways to charge for a subscription program. • What the advanced analytics reveal about the future of the subscription economy. Matt Darrow is the VP and GM of Product of Zuora. He’s a University of Berkley graduate who has been with Zuora for more than five years. Zuora is one of the top subscription billing platforms, serving clients like Zendesk, Docusign, HBO, Ford, Time, Inc., Zoom, Box, Dell and hundreds of others. 2. What is Fueling the Growth in the Subscription Economy? “The traditional media companies and print providers have been doing subscriptions for 100+ years. A lot of the new interest in the market that we see is all the ‘software as a service’ or technology vendors, or even traditional hardware manufacturing companies that are connecting their devices to the Cloud and actually providing over the top services and access to any of their physical devices,” replied Matt. “So, I think that the key reason for the growth and why subscription companies are growing nine times faster than the S&P500 is that they’re not only focused on delivering outcomes, but they’re delivering services that continuously enhance their value over time.” Simply put, customers today “want to own an outcome instead of paying for a physical product and service.” The growth not only comes from the subscription element, but also from the focus on each member’s experience. It’s about transformation rather than transactions. Zuora publishes a Subscription Economy Index report providing a wealth of information about this growing industry. In this report, it is stated that at least half of the subscription growth comes from existing subscribers. This led to my next question. 3. What Advice Can You Offer About Member Retention? Subscriber retention is necessary for a subscription business to remain successful. “When you’re running a subscription-based business model, churn really can cause the biggest challenge to that model. If you’re not managing churn, and you’re not managing your customer retention growth, you’ll hit a wall very, very quickly. You can have the greatest sales and marketing team and the greatest acquisition team, but you’ll kind of be spinning in place if you keep churning clients,” added Matt. When most people think of subscriptions, they think of a fixed monthly pricing, meaning one fee for the product or service. Zuora has many customers that use several other types of pricing models. 4. What Type of Pricing Models Do You Recommend? 1. Use different frequencies of billing clients. 2. Have different price points tiered for different commitment levels. 3. Divide your products into upgrade packs. 5. Consider a usage model, where the member only pays for what they use. 6. Price things out internationally. In addition to trying different pricing models, it is beneficial to measure and examine your results. One of the features I love about Zuora is the analytics report that allows their clients to flag customers who are about to churn or identify those who might be ready for an upsell or cross-sell opportunity. 5. What Data Does Zuora Measure and Why? “The metrics engine is one of the six core components of the platform. We measure metrics like monthly recurring revenue, annual contract value, churn rate, net retention, all of those key non-gap metrics which are the governors of subscription businesses. We allow clients to start to blend in information on how their customers actually engage with and use their service, and that allows them to derive a whole set of behavioral metrics. And that ultimately leads us into predictive indicators where, if you have a great grasp on your customer financials (when they started, what’s their lifetime value, what’s their monthly recurring revenue rates), you can start to combine that with their usage patterns. You could start to do some really clever things around identifying a score that’s going to quantify a probability of churn or even a level of engagement with the service which is a proxy for how likely are they to renew” replied Matt. In addition, Matt shared how the analytics help with improving customer engagement, optimizing activity, and even upsells. 6. How Does Zuora Guide Clients In Their Upsells? By upselling, you manage to keep your product or service relevant and exciting. In this summary of our interview, we covered many tools to give you more visibility, more control, and greater recurring revenue in your subscription program. For more information from this interview, you can read the transcript or listen to the audio file by clicking on the links below. I encourage you to visit Zuora.com. and give Zuora a test drive, look at the engines, and find out what it can do for your subscription business. This was a brilliant interview with a very professional summary at the end, thank you Robert. Very kind Laurence. Thank you!